The Afghanistan Research team of the independent World Security Network Foundation (Prof. Ludger Kühnhardt, left; Dr. Mario Ohle, second from right; Dr. Hubertus Hoffmann, right side) met German Bundeswehr Brigadier General Heinz Feldmann (second from left), Spokesman for the ISAF in Kabul and asked him about progress in Afghanistan and plans for the time after 2014. The Afghanistan Research Team of the independent World Security Foundation had the privilege to interview two experienced generals from the German Forces (Bundeswehr), who serve at the ISAF Headquarters and ISAF Regional Command North in Mazar-e-Sharif, about the progress in Afghanistan and the balance of power between the Afghan National Security Forces (ANSF - Afghan National Army, Afghan National Police and Afghan Border Police) and the insurgents, now labeled as "enemies of Afghanistan." Contrary to the mainly negative picture painted in the international media, both are more optimistic and realistic in their analysis. 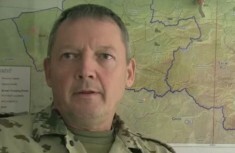 Brigadier General Heinz Feldmann has been the Spokesman for the ISAF based in Kabul since June 2013. Before that, he served in 2010 as Commander of the German Special Forces (Kommando Spezialstreitkräfte) in Calw. Brigadier General Michael Matz was the proud commander of the famous Gebirgsjägerbrigade 23 (Mountain Infantry) in Bad Reichenhall in the beautiful Alps before taking over the position of Deputy Chief of Staff for ISAF RC North in February 2013, where he is responsible for planning and for cooperation with the Afghan forces. His focus is on the situation in the northern part of Afghanistan - a large area 1000 kilometres long and 400 kilometres wide. It is time to begin a realistic analysis, sticking to the course set in Tokyo in 2012 with a fresh, proactive Afghanistan policy to maintain progress that was only made possible with many sacrifices by the men and women in ISAF and ANSF and most of all the people of Afghanistan.